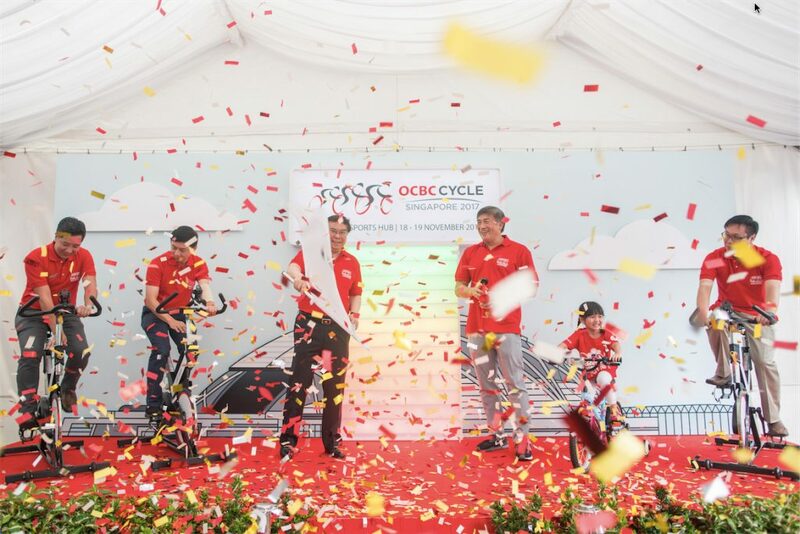 OCBC Cycle 2017, Singapore’s largest mass cycling event, returns on 18 and 19 November this year at the Singapore Sports Hub with the launch of a new race category for corporates. For the first time in Singapore, companies can pit themselves against one another to vie for top honours at the inaugural OCBC Cycle Speedway Corporate Championship. 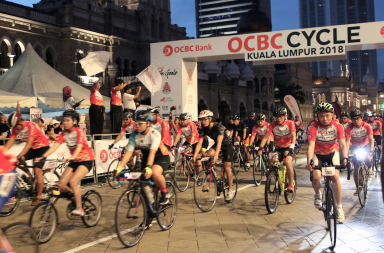 OCBC Cycle aims to attract 32 companies to participate in this unique race. (From left) News Editor of The Straits Times, Mr. Marc Lim, President of the Singapore Cycling Federation, Mr. Jeffrey Goh, Group CEO of OCBC Bank, Mr. Samuel Tsien, CEO of Sport Singapore, Mr. Lim Teck Yin, young cyclist Ariel Ow Yong and Editor of The Business Times, Mr. Wong Wei Kong, officiate the launch of OCBC Cycle 2017 at orchardgateway (photo credit: OCBC). 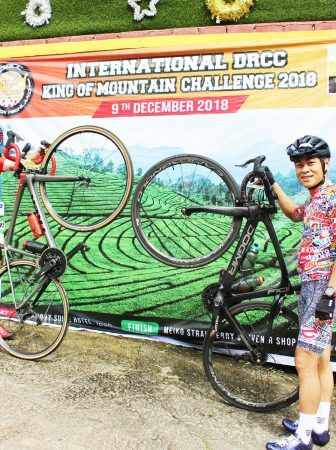 Two corporate races will be held on 2 and 30 September on the track of the National Stadium to pick the top six corporate teams – three teams from each day – to move on to the OCBC Cycle Speedway Corporate Championship final on Stadium Drive on 18 November. There will be three qualifying rounds of races on 2 and 30 September each, giving avid corporate cyclists lots of opportunities to race and have fun. 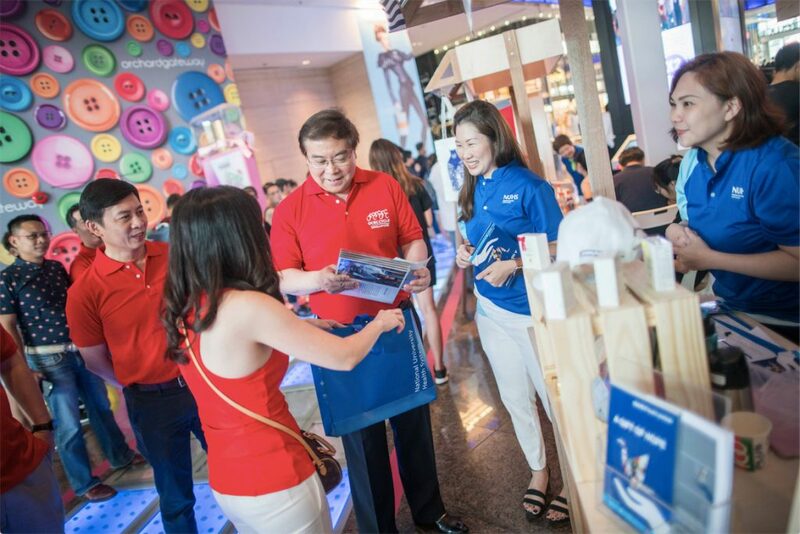 President of the Singapore Cycling Federation, Mr. Jeffrey Goh (left, in red) and Group CEO of OCBC Bank, Mr. Samuel Tsien (centre), interact with staff from NUHS Fund, one of the charity causes supported by OCBC Cycle (photo credit: OCBC). 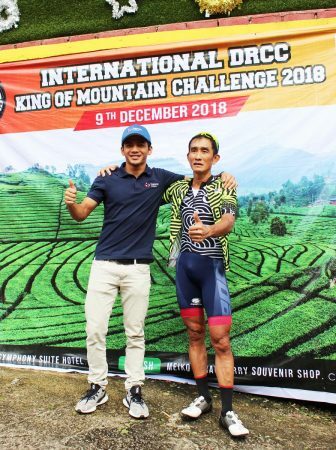 The new OCBC Cycle Speedway Corporate Championship race format mirrors the popular Speedway Championship races for local cycling clubs and South East Asian teams. It features a four-rider team relay where each team is split into two pairs to cycle five 400-metre laps. After the first two riders complete five laps on the 400-metre course, the second pair of riders will be tagged to power through the next five laps. 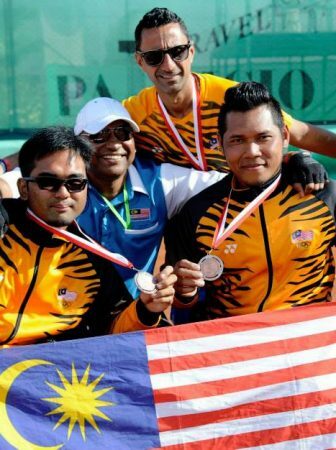 The team with the fastest time recorded when the last rider crosses the finish line will emerge victorious. 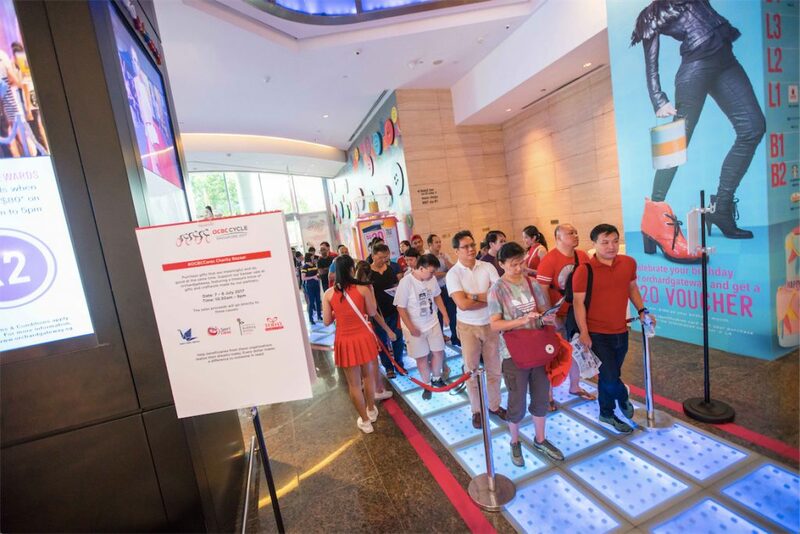 Crowds gathered before the launch of OCBC Cycle 2017, some even having queued up overnight, with more than 200 signing up onsite at orchardgateway (Photo credit: OCBC). The first cyclist who registered at the event launch at Orchardgateway received a gift bag worth $888.90, which included a Casio EXILIM EX-FR100 Action Cam worth $629, orchardgateway shopping vouchers worth $200, Polar vouchers worth $50 and a Polar sports towel worth $9.90. The next 299 cyclists to register will receive registration fee discounts of up to 25% and get gift bags containing items like Polar sports towels and vouchers. Registration is now open on www.ocbccycle.com.